The albums on this page act as a curtain-raiser for the entire anonymous covers album genre. 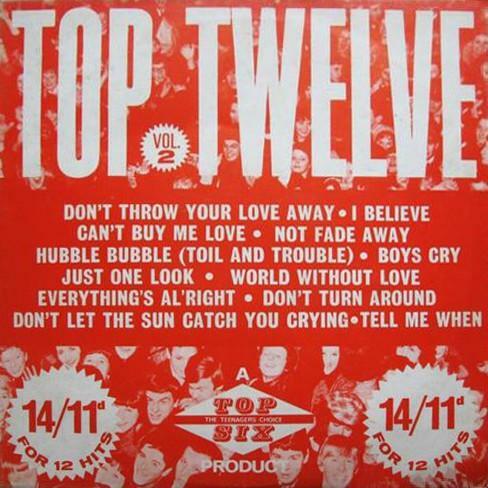 They were the creation of Australian Bill Wellings, who since 1962, had been issuing EPs on a DIY basis, under the name Top 6. In 1964 a distribution deal was done with Pye, and the EP series re-launched as "Top Six" (with "six" written out as a word), and significantly, LPs were to be released as well. 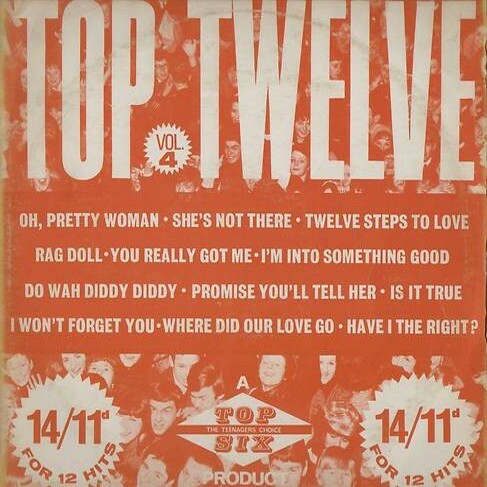 Top Six was also the name of the label and the first Top Six LP was in fact a tribute album called Beatlemania, which entered the official UK album charts, reaching a high of 19 - the first and only anonymous album to chart before the 1970s. (This record accounts for the first catalogue number, TSL 1.) 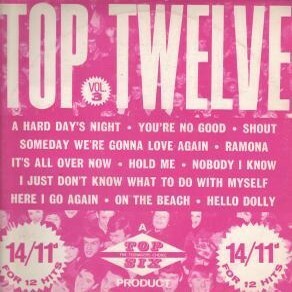 But also in the shops was Volume 1 of "Top Twelve" (on the Top Six label of course). The LP was in effect a compliation of the first two EPs, representing a marriage of the two formats which would remain unchanged for the whole of this series (see page detailing the EPs for further information on the 7-inch and 12-inch cross-overs). Four albums would emerge in 1964, but by the end of the year they were retired, bringing a temporary halt to this embryonic format. The EPs continued meanwhile, with more than 40 appearing until 1967, when the series was stopped. Wellings had by then released another DIY album, Top Ten Spectacular, before hooking up with mfp to launch their "Hits" LP series (see separate page) and at this point, the EPs split, with some staff going off to the Avenue label and embarking on their EP series instead. It would not be long thereafter that the Top Six identity ended for good. 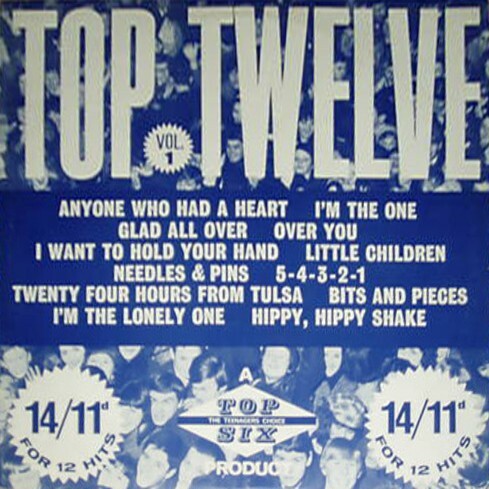 Comments: This LP contains all the tracks from the Top Six EP numbers 1 and 2. Comments: This LP contains all the tracks from the Top Six EP numbers 3 and 4. Comments: This LP contains all the tracks from the Top Six EP numbers 6 and 7. Comments: This LP contains all the tracks from the Top Six EP numbers 8 and 9.